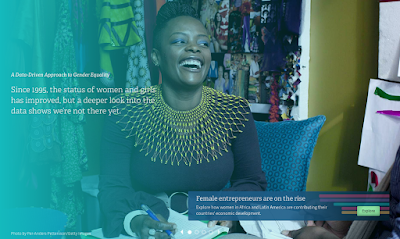 No Ceilings uses data sets to tell stories about gender inequality worldwide. What are the stories behind the data? On March 9, 2015, one day after International Women’s Day, former Secretary of State Hillary Clinton, Gates Foundation co-chair Melinda Gates, and Clinton Foundation vice-chair Chelsea Clinton celebrated the official release of No Ceilings: The Full Participation Report in New York City. The Clinton Foundation and Bill and Melinda Gates Foundation are not the first to use big data to compare and analyze levels of women’s empowerment around the world. In the 1990s, the United Nations Development Program created the Gender-related Development Index (GDI), the Gender Empowerment Measure (GEM), and more recently, the Gender Inequality Index (GII). The Organisation for Economic Co-operation and Development, an international organization composed of wealthy democracies, has its own Social Institutions and Gender Index (SIGI). If these measures should appeal to anyone, they should appeal to me, a social scientist who studies women in politics across countries and continues to use large data sets. But I also have questions and reservations about global data sets that compare women’s lives, some of which grew out of the interviews and daily interactions I had while working on my book in the Republic of Niger. 1. Is one approach to marriage necessarily better than another? The World Bank has, at least since the late 1980s, been interested in improving women’s lives by encouraging governments to change laws concerning the family. When I first visited Niger, I wanted to understand why the country’s leaders had not reformed its collection of family laws per the World Bank’s wishes. Later, I decided to investigate the history of another non-reform, Niger’s non-ratification of a regional African Union treaty on women’s rights. One issue in both controversies was family property; could, for instance, a daughter inherit the same amount as a son? According to many projects that compare women’s statuses globally, the prevalence of unequal inheritance practices or laws lowers a country’s international ranking. SIGI, mentioned earlier, examines a large basket of items and takes into account the inheritance rights of daughters vis-à-vis sons. Something I was unconsciously ignorant of at the beginning of my fieldwork was the difference between community-property and separate-property marital regimes. In California, where I spent most of my upbringing, community property is the default law. In what I believe to be a large percentage of households in Niger, the default regime is not community but separate property. That is, a wife maintains her finances separate from her husband, and vice versa. People with whom I spoke said they did not know how much money their spouses made per month or year or how much wealth their spouses possessed. Under the ideal form of separate-property ownership, a wife uses her finances for her own purposes, whereas the expectation is that a husband uses his finances to provide food, shelter, and other amenities to the entire family. If men are expected to provide for the entire household and women are expected to keep their own property, then it is fair, for many of the men and women I talked with, for sons to inherit twice as much as daughters. Things become complicated when, in reality, wives use their resources to also provide for the family. School fees, children’s clothes, medicines, small gifts, and money for children to spend on food while at school may become the purview of women or women and men. It is also possible that separate property regimes better position women (and men) in the option of leaving one’s marriage. I wonder whether the divorce rate among certain communities in Niger, which is comparable to that of the U.S., is linked to this. What I came to realize is there are alternatives to community-property marriage that are widely practiced, and it is important to consider the advantages and disadvantages of marriages where financials are kept separate. 2. Are global rankings of women’s statuses a modern reincarnation of the distinction between “civilized” and “uncivilized”? By no means do I believe that those compiling global comparisons of women’s statuses want to portray the Global South as “uncivilized.” What concerns me, however, is the idea that may emerge from these rankings, that “other” countries and peoples need help but not “my” country or people. This problem is akin to the use of #firstworldproblems, which started with good intentions, but ends up denying that there are problems of access to quality education, malnutrition, poverty, and violence in wealthy countries and that people outside the first world can have so-called petty problems. The discourse of “these women” being better off than “those women,” I find, can unintentionally perpetuate misunderstanding and be used as part of a backlash against women’s movements. More than I had anticipated, and something I learned from scholars such as political scientist Abdourahmane Idrissa, anti-family law reform and anti-African Union treaty activists used nationalist rhetoric to combat proposed changes to family law. Nigérienne women’s activists were painted as “foreign,” even though most Nigériens could be just as well traveled. 3. How do “non-experts” define inequality differently than “experts”? One of the most unsettling but illuminating moments in my fieldwork was when a female religious leader asked me why so many foreigners were coming to her, asking her about the lack of family law reform in Niger. Isn’t the real problem poverty? she asked, turning the tables on me. I wonder what the No Ceilings report or the SIGI index would look like if they were directed by women and men in the Global South, or by women and men of different socioeconomic classes in the Global North and in the Global South. Alice J. Kang is assistant professor of political science and ethnic studies at the University of Nebraska–Lincoln. She is author of Bargaining for Women's Rights: Activism in an Aspiring Muslim Democracy. "Alice J. Kang compellingly argues that governments are more likely to adopt women's rights reforms when local activists mobilize for them, that opposing activists must also be considered, and that political context is essential for understanding outcomes around women's rights." 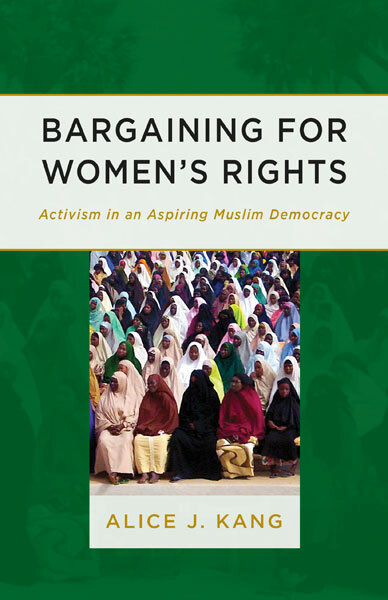 "Bargaining for Women’s Rights is a refreshing approach to thinking about women's rights in majority Muslim countries that captures how civil society groups mobilize and how multiple components of 'the state' actually debate women's rights legislation."